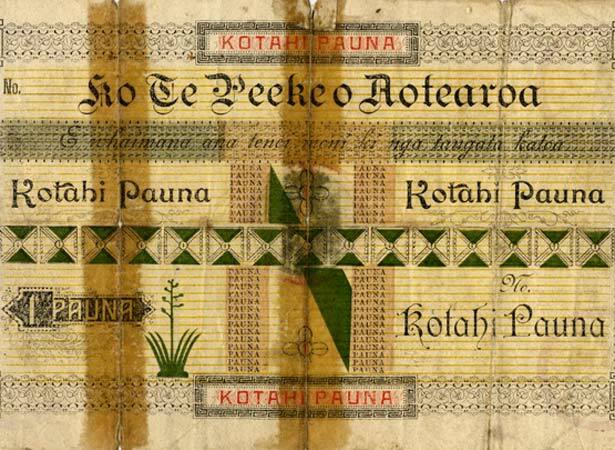 17 March 1905 is the date written on the only cheque issued by the Maungatautari Peeke (Maungatautari Bank) that is known to have survived, and is now displayed in the Cambridge Museum. The cheque, signed by ‘Tawhiao’, instructs Wi Pewhairangi to pay Henare Matanuku £500. It was found by a teenage girl in a derelict building at Maungakawa in south Waikato, one of King Tāwhiao’s residences in the late 19th century and the site of one of three known branches of the bank, which was in existence by 1886. The Maungatautari Bank was one of several set up by Māori in the decades after the New Zealand Wars to handle the money they were receiving from land sales. The Kīngitanga (King Movement) operated at least two – the other was the Bank of Aotearoa, which in this context probably meant the territory held under the King’s mana. While the Maungatautari Bank didn’t issue its own currency, its cheques were useful for transferring funds between customers. Though the man who is now remembered as Tāwhiao died in 1894, the date of this cheque does not suggest sharp practice. Successive Māori monarchs have taken on the names of their predecessors; King Mahuta was also known as Tāwhiao, and it was perfectly proper for he or his nominee to sign a cheque with this name.